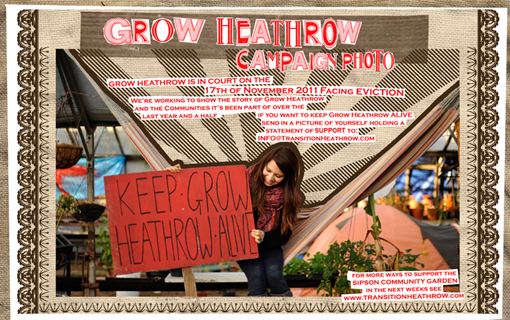 As a network of community food growing projects, we deplore the attempts to evict Grow Heathrow. Community food growing projects hold so many of the answers to the big challenges posed by the mounting economic, environmental, social and health crises. Grow Heathrow are a good example of a group of citizens taking initiative to create social and environmental value, with very limited resources. They merely need space, and time. we support their proposal to set up a community land trust. Get down to Uxbridge County Court for 9.30am on Thursday 17th November for a big show of support outside the court. Simply love what you’re doing 🙂 Dont be stopped.